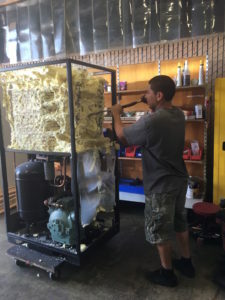 We provide field service, in-house rebuild, refrigerant charges, upgrades to new refrigerants and more to all brands of water vapor cryopumps. In addition, we can provide a completely rebuilt Polycold unit with 12 month warranty at 40% off the cost of new. For customers needing a turnkey project, we can also supply the refrigerant lines, feedthroughs, cryocoil and installation. Retrofits on existing chambers are usually economical as faster pump down provides more productivity. Mean time before major rebuild is similar to a new Polycold. Turn-Key Chamber upgrades to add Polycold for water vapor pumping. Schoonover provides replacement refrigerant charges for all models of Polycolds. Models from the P-75 to the PFC 1102HC. The refrigerant charges are a mixture of gases that enable the unit to cool from room temperature to cryogenic temperatures. In addition to full charges, Top Off Charges are also available if the charge is mostly intact in the unit but the lighter gases have been released. Refrigerant Charges ship Fed Ex on a worldwide basis. Please note: some countries do not allow non-Kyoto compliant gases into their countries (such as the EU). 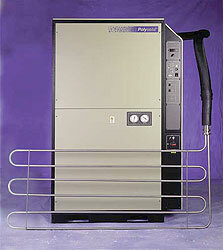 In those cases, your Polycold would need to be rebuilt to handle the compliant gases. Therefore, contact us for more information. Schoonover can provide service and rebuilds of your Polycold units in our California facility. Units coming in are quoted for all consumable parts replacement. Rebuilding include new foam in the stack and helium leak checking the copper coils. . Once the unit is leak checked, the compressor is tested and replaced with new if necessary. The unit is then outfitted with a new refrigerant charge and fully tested before being boxed up for return. Warranty is 12 months for the parts/work replaced. Our factory is equipped with the same foaming and heat load test equipment as originally used at the manufacturing facility to return the unit to as close to "as new" as possible. To set up service, contact us for an RMA (Return Material Authorization) number to note on the shipping documents. Once you have received this number, we will send you shipping instructions. Do you need an additional water vapor cryopumps for your chamber systems? As an alternative to the high cost of new capital, why not consider a rebuilt chiller ? We can provide you a fully rebuilt unit with a new compressor with a 12 month warranty. 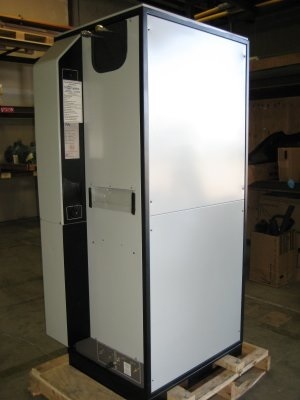 In addition, provide a unit that has the Kyoto compliant "green gas" charges. Pricing for the rebuilt unit is approximately 60% the cost of new. Since all rebuilt units have a new compressor, fresh consumables and a new charge, the unit should be ready to run for an extended period. Therefore, longterm cost of ownership should be similar to a new unit. 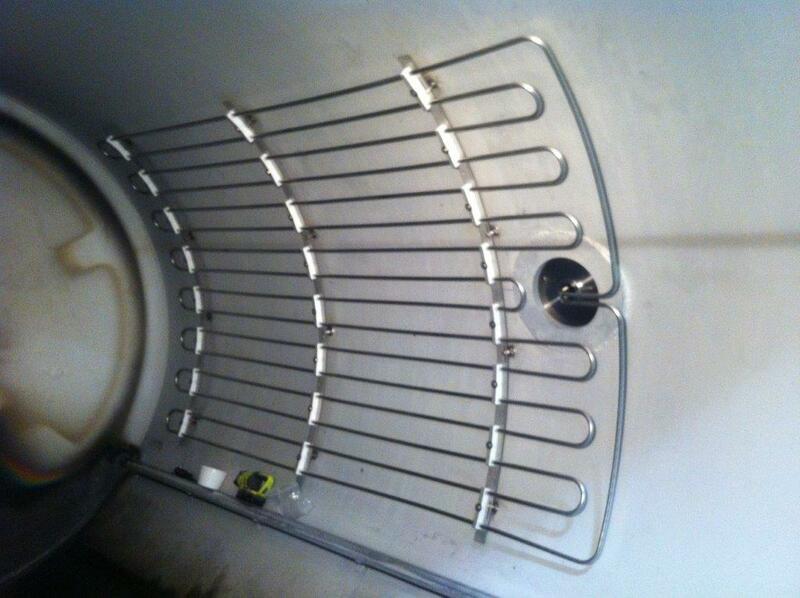 Needed accessories for installation include refrigeration lines between the Polycold and the cry-coil. Just specify the length and if you want Parker or Cajon Fittings. Also, indicate if the connections need to be 3" off-set or even. Spare parts are also available. Field service repairs is provided on all models. 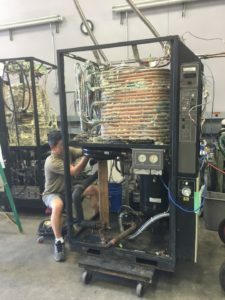 Trained service technicians out of our California facility can provide preventative maintenance plans/services and/or field repairs. In addition, priority service for situations where production is down can usually be accommodated. We design and fabricate cryo-coil designs for all models. Our engineers can take your chamber data and design a coil that fits into that space. This coil design provides maximum efficiency for pumping water vapor. Also available is installation of the cryocoil.. To get started, provide pictures of the areas in your vacuum chamber system where a cry-coil could be located. Starting in 2020 in the USA, refrigerant for Polycolds ending in 0 (ex. PFC 1100HC) will no longer be available due to R-22 no longer being manufactured. These environmental regulations will result in that older units will need to be rebuilt to take the new Kyoto compliant "green" refrigerant gas. Our shop can handle this upgrade with the cost being approximately 30% of new. This upgrade will bring the unit totally up to run to specification with the new refrigerants. Starting in 1999, Schoonover sold water vapor cry-traps to OEM's & end users. In 2005, Polycold was sold and we lost the product line. But our Experience carried on and we combined forces with a former Service Manager to continue to assist customers in service & support. In our manufacturing facility, we choose to emulate as close as possible to the Original Equipment used on the original build of the unit. Combining our Sales Experience and best in class Customer Support, we have quickly become the predominate service provider of equipment, service and installation. Products wise, we Upgrade Older Units while providing Lower Pricing on all refrigerants (both old & "green gas 02 blends). 1. Our Technicians are trained by a former Polycold Service Manager. 2. Equipment used in foaming & testing all remanufactured units is the same used in the original manufacturing. 3. Temperature load testing is completed on every unit verifying that the unit can handle the specified heat load. 4. Compressors are fully tested and if needed replaced by new, not rebuilt original equipment compressor. 5. Warranty of 12 months on refurbished units and 12 months on parts/labor replaced in our factory on your rebuilt units.